Jesse has over ten years of experience in design and has been a recipient of many top awards in the book publishing industry. He has maintained Jesse Sanchez Art & Design in the downtown New Rochelle area since 2003 and specializes in book cover design, type design, print promotional materials, fine art posters, and illustration in a variety of mediums. Jesse has done consulting work for many well-known book publishers including Grand Central Publishing, Simon and Schuster, Penguin Random House, Kensington Books, and St. Martin’s Press. He was formerly the art director at M.E. Sharpe Publishers in Armonk, NY. 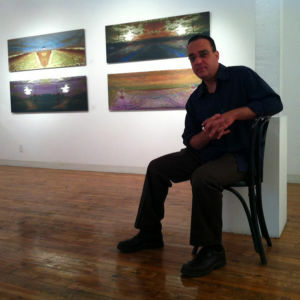 Jesse is an accomplished artist and often shows in Chelsea and other venues in Westchester. He was president of the New Rochelle Art Association from 2006 to 2015 and is a board member of The Castle Gallery at The College of New Rochelle. In 2012 he joined the Municipal Arts Commission of the City of New Rochelle as a creative consultant on the application of commercial signage. Through the commission he has initiated several public art projects in the downtown area. He works tirelessly because he believes that art represents the best of ourselves. Visit his website at http://www.jsanchezart.com.